Rose-hip oil: This one is my new favourite face oil. I love how it quickly absorbs into my skin, plus it helps beat eczema or any type of dermatitis. 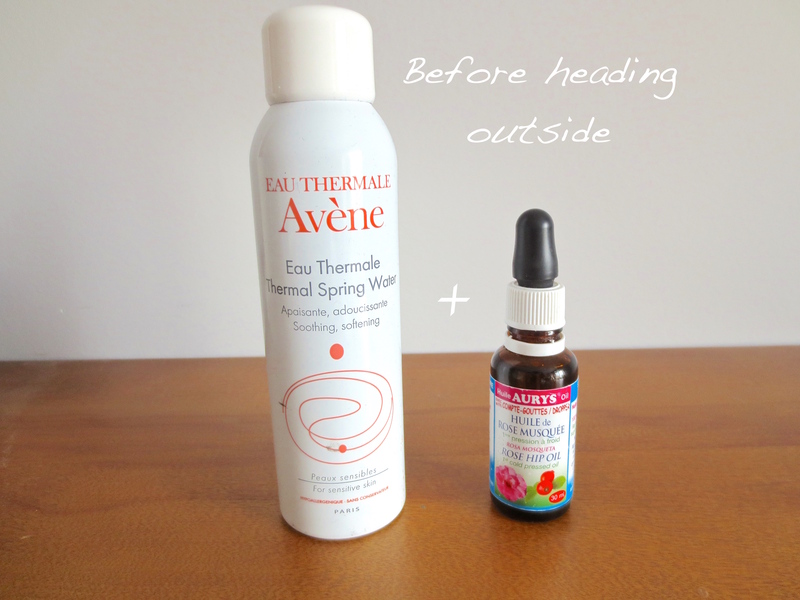 If my face is feeling particularly dry, I’ll spray some Avene Thermal Water spray first and follow with some rose-hip oil. I like doing this especially before I leave the house (it’s like Chapstick for my face!) and before bed. It is on the pricy side, but a little goes a long way. Jojoba oil: this oil is known to have the same PH level as our skin. I prefer in on my legs after shaving. Also helps prevent frostbite and doesn’t get too greasy. Coconut oil: I know, you’ve heard so much about it. But here’s a trick to avoid drying makeup removers: coconut oil moisturizes while cleaning and removing makeup. I also put it on my eyelashes at night because it’s supposed to strengthen them help them grow. Not sure if this works, but after years of abusing my eyelashes with heavy mascaras and eyelash curlers, I’ll give it a try. Do you have any tricks to help with dry skin?